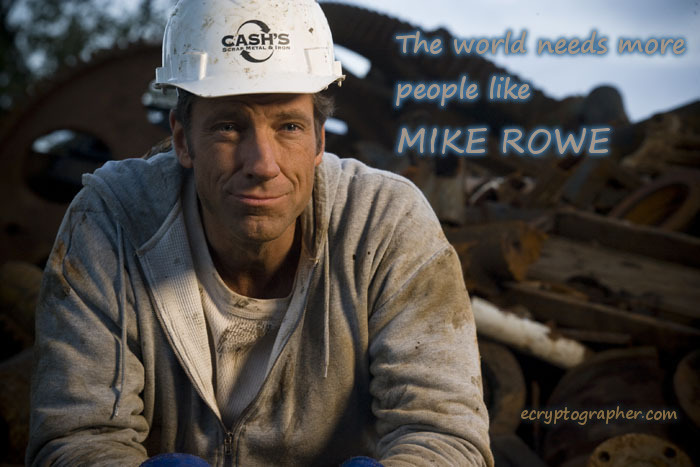 We need more people like Mike Rowe in our political conversations. So much is missing from the arena of political discourse today that Mike brings to the table. Please indulge me so I can tell you the more prominent characteristics I see. No doubt, most people are familiar with Mike from the television series, Dirty Jobs. For anybody unfamiliar, Dirty Jobs followed Mike and a small television crew across the country showing Mike getting dirty with real people doing the jobs that most of the rest of us don’t want to. He wallowed in septic tanks, mucked animal pens, and even helped to test shark suits. So, quality number one, Mike has dirt on his hands from honest to goodness hard work. He did it while working in some of the most unpleasant situations imaginable. Mike didn’t come from an affluent family. He doesn’t live a life of high privilege. Nor does he regularly mingle with the rich and powerful. Rather, he has devoted his life to highlighting some of the lowliest occupations that people do for a living that make this country work. He gives them some honor, and shows that there is value in what they do. Quality number two: Mike knows how to communicate gracefully with people who disagree with him. I can’t tell you how many times I have witnessed behavior in the comment sections on Facebook that is loaded to the sky with hatred, vitriol, meanness, and lack of regard for a contrary point of view. I also hear it in so much of the political discourse that seeks to blame the other party for all that ails the country today. There is no name calling. There is no condescension. There is no assignment of blame. There is simply a direct answer to a concern that is civil and respectfully presented. Mike doesn’t easily swerve from the things he believes in; but he is a master at skillfully articulating his point of view. Unfortunately or not, depending on how you look at it, Mike doesn’t appear to have any present political ambition. Instead, Mike’s time and attention are focused on promoting a nonprofit organization called mikeroweWORKS. MikeroweWORKS focuses on raising awareness regarding training for jobs that nobody seems to want and even provides scholarships to help people be able to receive the technical training to work in them. This highlights quality number three: rather than waiting for government to step in and provide assistance, Mike is out there helping ordinary people achieve a higher standard of living through vocational education and employment. Mike is out there, getting his hands dirty, putting his money where his mouth is making the world the way it should be through his own efforts rather than only lamenting that things are not as they should be. There is no bureaucracy, there is no red tape, there is only hard work and a desire to help others work hard and to achieve their dreams. The qualities that Mike embodies are not out of reach to those who are willing to work towards them. No doubt we, as citizens of the planet earth, can do more to embody the spirit of hard work. We can endeavor to make our communications with others mature, respectful, and articulate especially when we disagree. And we can seek to not lament the problems we see, but actively seek to fix those problems and to help others along the way.